Carter Girl, plus family and friends, delivers a rousing tribute to personal and family history. 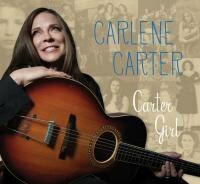 Carlene Carter's place in the history of American music was assured long before the conception or recording of her new CD, Carter Girl, but its creation makes for a solid insight into her world. As daughter of June Carter Cash and Carl Smith, and granddaughter of Maybelle Carter, her view of the machinations of the music industry is informed by family and history, and the weight of both of these factors has influenced her career of some 35-plus years. During that time, Carter has issued nine studio albums and over 20 singles, leading up to this new record. The new album serves as a tribute to her musical forebears, but also as a statement of self. Her sound, even when paying tribute to Carters previous, is very much her own. The songs themselves are gleaned from both her own songbook ("Me and the Wildwood Rose"), and that of her family; the original Carter Family (the versions of the traditional songs "Black Jack David" and "Gold Watch and Chain"), her mother ("Tall Lover Man"), and aunt Helen ("Poor Old Heartsick Me"). An updated "Lonesome Valley" (here titled "Lonesome Valley 2003") acts as a tribute to both Carlene's mother, and Johnny Cash, and Carlene's half-sister Rosie Nix Adams, all of whom passed in that year. Carter's oeuvre reflects her own rock influences as obviously as it does country, with "Little Black Train" taking a deep breath of atmospheric electric guitar and bass, complemented by flashing Rhodes and sonorous backing vocals. The chug of the train is echoed in the effective harp lines. "Me and the Wildwood Rose" is a tribute to her family, but also acts as a description of the journey the music has taken, complete with subtle musical motif as a neat reminder. The driving, rambling treatment of A.P. 's "Blackie's Gunman" brings out the best in the album's musicians, which include Jim Keltner, Greg Leisz, Sam Bush, and Don Was on bass. Carter Girl also has contemplative, almost sad moments, such as "I'll Be All Smiles Tonight", with its late-night barroom setting, and the quietly devastating "Troublesome Waters", on which Carter is serenaded by the voice of experience and loss that is Willie Nelson. Carlene's take on "Lonesome Valley" is personal and profound, extrapolating family loss to lessons we can all learn. The chorus sees Carter's vocals united with those of Vince Gill. Carter is not afraid of updating older songs, in fact, it is her pride and joy. Joy is given to songs like "Tall Lover Man", lifting her mother's story from the pages of history and giving it a rousing, upbeat tone. The beautifully balanced take on "Gold Watch and Chain" is delivered with knowledge, awareness and passion, as is the delightful "Black Jack David", which features Kris Kristofferson. An updated version of the rousing, soulful and true "I Ain't Gonna Work Tomorrow" rounds up the album, incorporating vocals from earlier takes from Helen, June, Johnny and Anita Carter. Carlene has explained that she feels charged with the responsibility of maintaining and extending her family's music, and without falsehood or artifice of any kind, she does exactly that on Carter Girl.